Delta Flight 1288 was a domestic flight from Pensacola (PNS) to Atlanta (ATL). The MD-88 taxied to runway 17 and was cleared for takeoff at 14:23. The first officer, who was the pilot flying, advanced the throttles and called for the autothrottles to be set when the engine pressure ratio (EPR) reached 1.35. The throttles were advancing in the autothrottle mode when the flightcrew heard a "loud bang,"’ followed by the loss of cockpit lighting and instrumentation. The airplane had reached a speed of about 40 knots. The captain took control of the airplane and retarded both throttles to idle. He applied manual brakes and brought the airplane to a gradual stop on the runway. The captain did not command reverse engine thrust, and the ground spoilers were not deployed. It appeared that the no. 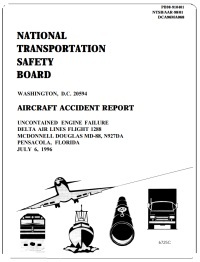 1 engine of the aircraft suffered an uncontained failure. Debris entered the passenger cabin, causing the death of two passengers seated at row 37 (seats A and C). PROBABLE CAUSE: "The fracture of the left engine’s front compressor fan hub, which resulted from the failure of Delta Air Lines’ fluorescent penetrant inspection process to detect a detectable fatigue crack initiating from an area of altered microstructure that was created during the drilling process by Volvo for Pratt & Whitney and that went undetected at the time of manufacture. Contributing to the accident was the lack of sufficient redundancy in the in-service inspection program." Distance from Pensacola Regional Airport, FL to Atlanta-William B. Hartsfield International Airport, GA as the crow flies is 435 km (272 miles).